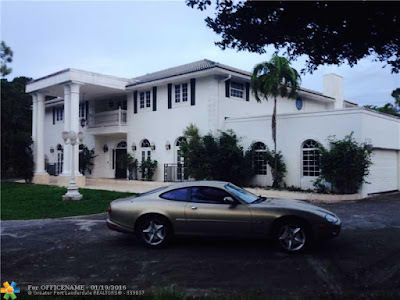 Broward Real Estate: Palm Beach Farms Five Acre Home For Sale! This Palm Beach Farms stunning home on rare five acres of land is in Coconut Creek, Florida. This size of land is very hard to find, located in the northern section of Coconut Creek only five hundred feet from the Boca Raton border. This house is in walking distance to the renowned Adios Gold Course. There is a five acre eco-friendly park right to this property. The property of the home feels like ten acres because the park is like part of your land. The yard is completely fenced in with an abundance of mature lush trees and vegetation. There is potential to build twenty five unit residence on this land. The main living areas are custom wood. The doors to the outside are all french. The grandiose large white pillars in the front give an opulent entrance. The sparkling swimming pool and spa is the perfect place to relax in your own backyard oasis. Residents of Palm Beach Farms are in close proximity to fine shopping, dining, and entertainment at nearby Boca Towne Center, Mizner Park and Sunset Cove amphitheater. The Palm Beach and Fort Lauderdale International Airports are just a short drive from this area.